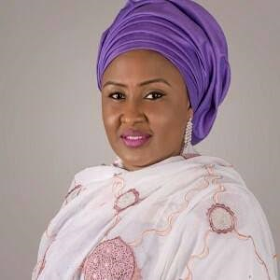 Wife of the President, Mrs Aisha Buhari on Saturday, expressed her condolences to the families of the six doctors and one driver that died in an auto accident along the Abuja-Kaduna Expressway on Sunday, April 24. The late doctors, led by the Chairman of the (NMA) Ekiti State chapter, Dr. John Akinbodte, who survived in the accident, died while on their way to Sokoto for the 56th Nigerian Medical Association's annual general meeting. "I wish to express my shock and regret over the death of six Ekiti State medical Doctors and their driver, in an accident." Mrs Buhari said. "Their death has deprived Ekiti state in particular and Nigeria in general of sound and brilliant minds who still had a lot to contribute to the growth of the nation. I pray that God will comfort their grief-stricken families and I wish the survivors of the accident speedy recovery"